So, say you have a messy room in your house that you really needed to clean today, but it didn’t get done. Then days go by and it keeps piling up with unfolded laundry and random things you don’t have a spot for in the house. The next thing you know the room is so messy that you don’t even want to clean it or know where to start. Now you are overwhelmed and just want to hide the mess by shutting the door. When your Eau Claire home experiences a water damage disaster that’s what happens if you leave water for too long. Timing is crucial. When it comes to your home or business, you want to take good care of it right? Well, there are some things that could wait a little while to get taken care of, like a new couch or getting your floors nicely polished. But there are also some things you just cannot and should not wait to do. One of these things being water damage clean up. If you think about it, you’d think, “Well, of course, I’d get it don’t as soon as I can!” But the reality is that sometimes you forget, or you get to busy with other things, or you just don’t want to deal with it at the moment. Our hope is that you will come to an understanding of how important it is to speedily clean up any water damage in your home or business with experienced professionals. So why does timing matter? The sooner you stop the water, the less area of space is damaged. That seems simple enough. If you leave a leak going for just a day longer, think of how much more damage is going to take place in more areas than you would probably think. If the water leak is spreading over a long period of time, it can even go as far as damaging the structure of the building and that can be very costly and time-consuming. Another big reason why timing is so important is because of mold growth. First of all, mold is just plain yucky. There are health risks when dealing with mold in the home and most of the time it is invisible in the air. Do you want to breathe in those harmful toxins? Or have your children and guests breath them in? Not only will the toxins be in the air, but because the moisture from the water doesn’t have anywhere to go, it’s going to find spots on the walls and the floors and turn to mold. When you call TRAC Solutions in Eau Claire, day or night, our emergency water damage team is ready to help you with these problems. We also want our time spent helping you to be as painless as possible. If there is a lot of damage done, it’s going to take more time. 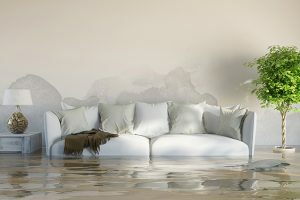 For your own comfort and safety, be conscientious about any water damage in your home and contact professionals as soon as you detect a problem. We hope this was helpful to you! Call us in any disaster situation and we will be there to help.